I’m so excited to let one of my new blog friends, Roxana, take over Shugary Sweets for the day! Not only does she make incredible desserts, but she has great bread making tips as well! Roxana is sharing a delicious Peanut Butter Cake that will knock your socks off! 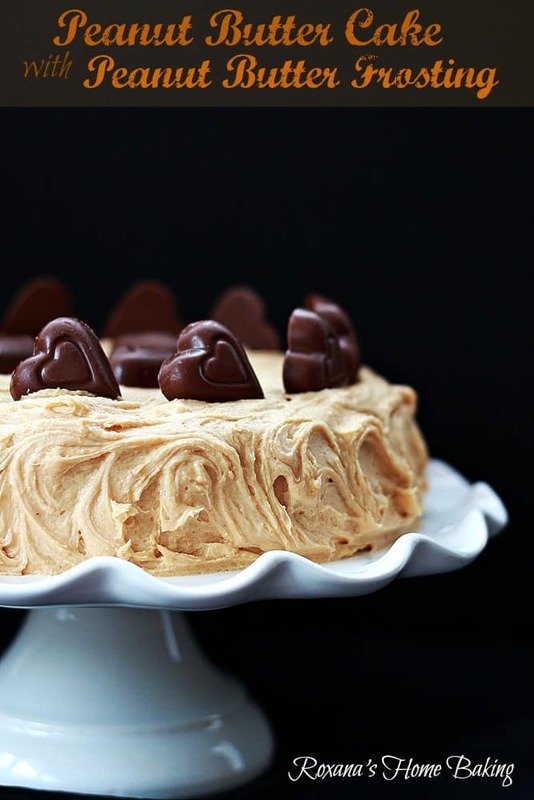 Look at those Reese’s Peanut Butter Hearts on top…they are also INSIDE! I wish I could say she not only is sharing on the blog, but also in real life. I’d LOVE a slice of this cake. Hmmm….does it ship well Roxana? Hello Shugary Sweets fans! For those of you who don’t know me, I’m Roxana, the baker, photographer and writer behind Roxana’s Home Baking. And as much as I hate it, I’m doing the dishes as well. My family, friends and neighbors are my trusty taste-testers. I love baking from scratch and my sweet tooth is the boss in my kitchen. I’m a chocolate girl at heart and you can always win me over with a loaf of freshly baked bread. 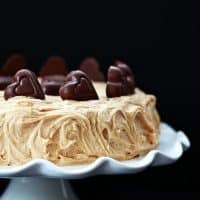 I’m happy to be here, on Aimee’s beautiful blog sharing one of my husband’s favorite cakes : Peanut Butter Cake. The idea of this cake came from a magazine I read while waiting for my dentist appointment. I quickly snapped a photo with my phone and couldn’t wait to get home and try it. To our disappointment the cake turned out so dry I deleted the picture and decided to make a peanut butter cake by my own heart. I wanted a light, moist cake with the right amount of peanut butter flavor. 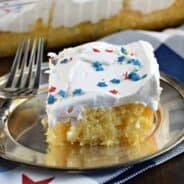 As you probably know, peanut butter tends to put a weight on baked goods and there’s a thin line between a light moist and a heavy dense dry cake. But no worries, this cake is everything you want in a peanut butter cake. It’s light, moist with a small crumb and here and there you get bits of chopped peanut butter cups/or hearts as I used this time. The peanut butter frosting is literally the icing on the cake. It’s creamy, silky and addictive! 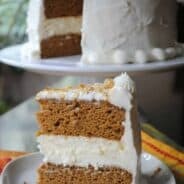 I highly recommend using heavy cream instead of milk for the best frosting ever! Thank you Aimee for allowing me to share this peanut butter cake recipe with your readers. I hope you’ll bake it soon (Valentine’s Day is just around the corner) and you’ll enjoy it as much as we did. I'm so excited to let one of my new blog friends, Roxana, take over Shugary Sweets for the day! 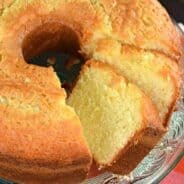 Not only does she make incredible desserts, but she has great bread making tips as well! 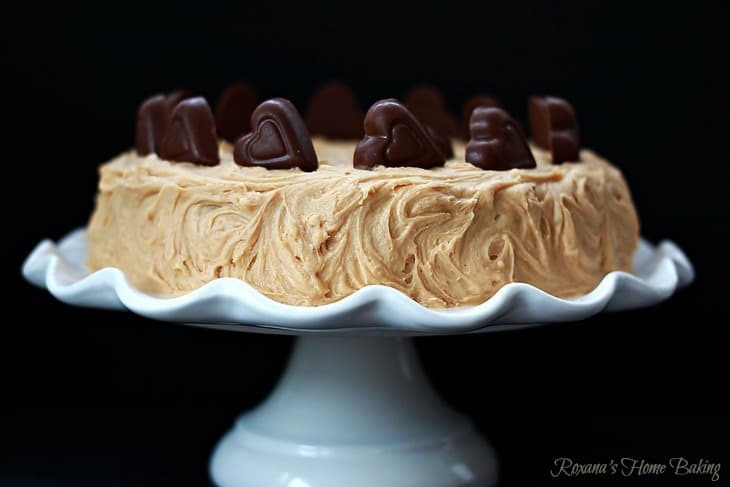 Roxana is sharing a delicious Peanut Butter Cake that will knock your socks off! Look at those Reese's Peanut Butter Hearts on top...they are also INSIDE! I wish I could say she not only is sharing on the blog, but also in real life. I'd LOVE a slice of this cake. Hmmm....does it ship well Roxana? In a mixing bowl cream butter, peanut butter and sugar until light and fluffy. Beat in eggs, 1 at a time. Shake the excess flour and add the chopped peanut nutter cups to the batter. With a spatula mix until combined. Me too Erin. Me too. Haha, I can’t get over the gorgeous frosting…. That is one incredible looking cake! It looks great Roxana! I think I need to meet up with this cake…and the frosting! Ooo la la!!! Of course YOU love this cake. It’s PB and Reese’s!!! This cake looks wonderful! I love it. This totally knocks my socks off! Will you ship one to me too 😉 Thanks for sharing this fabulous recipe. I adore Roxana’s recipes and her beautiful photos. So nice to see her sharing one of her amazing creations on Shugary Sweets. Roxana takes mouthwatering photos and this cake is no exception. I am just drooling over those swirls of frosting!!! WOW. This cake looks seriously amazing!! Peanut butter cake is one of the only cakes my dad actually enjoys, so I’m definitely pinning this to try when I’m back home! I can’t wait to make this cake myself!! This cake is definitely going on my to-make list. Everything about it is perfect! I agree completely, it is on my list too! Wish we could get Reese’s Hearts here in the Uk they look so cute and bet really tasty on top of that delicious cake. Yum! Sadness. What’s Valentine’s Day without Reese’s Hearts?! Wow! This cake looks stunning. Thanks for sharing it Roxana. And Aimee, once you know if it ships well, can you see if you can get a slice over to SE Asia? You could certainly get out of housekeeping duties with your roomies if you make them this cake!!! Wow, I am a peanut butter addict, so this is right up my alley! I have a few PB addicts in my house too who are begging for me to make this cake! Oh, this looks so delicious! I have to make this. 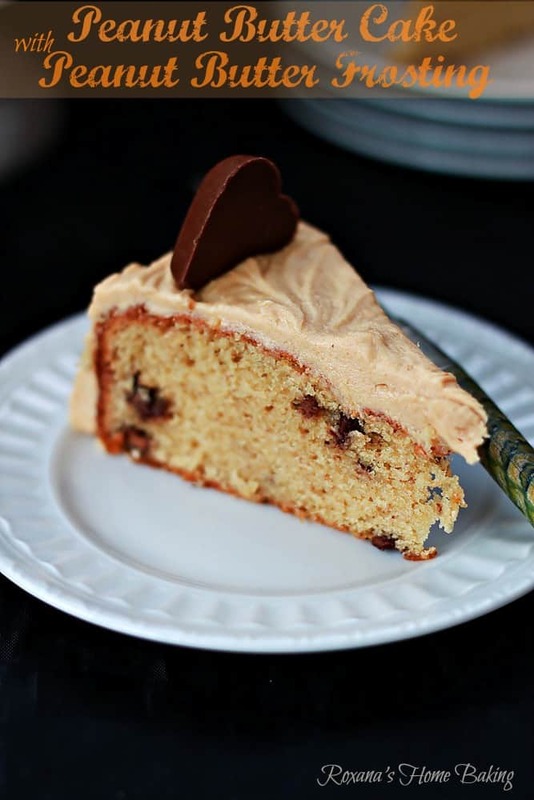 Im a huge PB fan and a whole cake of it AND the icing…looks like a perfect thing to me! My kids are begging for me to make this cake….looks like I know what we may be having for Valentine’s Day! OMG this cake is GORGEOUS. I wouldn’t be able to control myself around it! I know. I am having a hard enough time hitting my hand on the computer screen. DYING. OMG I want it. Roxana, you’re amazing! She is a PB genius! That is one heck of a cake! I adore peanut butter in any form! Thanks for having me over your gorgeous blog! It’s been a wonderful experience! Oh Roxana this looks amazing! Thanks for sharing! I am on my way over to your blog! You can’t go wrong with this combo and this is all sorts of right!! I’ll take the whole cake please! Man, this is one tempting recipe. Well this is just beyond gorgeous! I’d probably eat the whole cake in a day: truth. This cake is beyond amazing! Roxana is a cake genius!!! I love Roxanna’s baking, this is one gorgeous cake. She makes some gorgeous food!! Oh my god I tried making mini muffins using this recipe last night (I swapped the flour for oat flour) and of course they were kind of sunken because I didn’t add any regular flour, but they were SOOOO fudgy and peanut buttery and AMAZING! Thanks for a fantastic recipe!!! So glad you enjoyed them as muffins Erika!! Would these make good cupcakes? Baking them in cupcake pans instead of the cake mold.